Join the action seen in Batman Unlimited: Mechs and Mutants with this authentic Batman gauntlet. The bright, iconic glove slides on easily as you chase down the mutant DC Super-Villains plaguing Gotham City! When you catch them, activate the trigger and fire Batarang discs out of the Gauntlet and take the gargantuan enemies down! 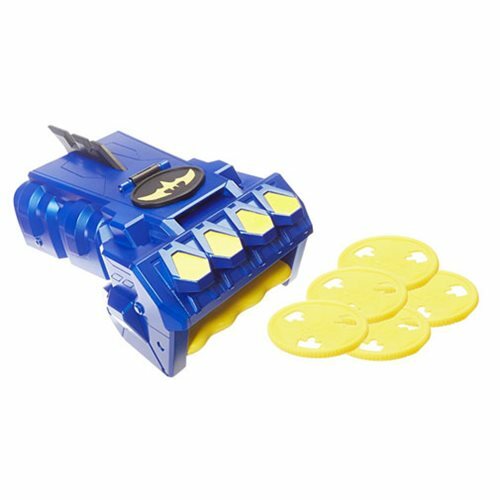 Includes 4 firing discs and also works with Batarang discs from the Batman and CYBEREX figure, sold separately, subject to availability. Put on your Batman battle gear and save the day like the Caped Crusader! Colors and decorations may vary.